A former football coach was sentenced Tuesday to a year in jail for making racially charged threats to employees at Ameritas. "Very clearly what stands out in this case is Jose Jefferson made a big mistake," said his attorney, David Watermeier, who sought probation for his client. Jefferson, 38, has taken responsibility. Watermeier said an anonymous letter showed up on Jefferson's desk at Ameritas, where he worked as a licensed insurance broker. When he tried to find out who sent it, the attorney said, he was rebuked. 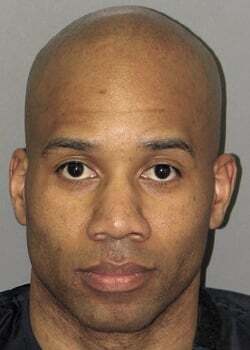 Watermeier said co-workers resented that Jefferson had been hired through a friend and considered him less qualified. Jefferson admitted writing two letters in response that threatened death to all blacks and said one who worked there would be killed on a date in February. Ameritas gave black employees the option of not coming to work for two days, police said. In March, police arrested Jefferson and Christina Donald, who has admitted helping write the letters. She is awaiting sentencing. Jefferson, who lives in Illinois and works at a sports equipment company, pleaded no contest to a felony charge of making terroristic threats in June. In court Tuesday, he said he was neither proud nor happy about what he did, but that he had felt wronged and the situation engulfed him. He said he should have walked away from the job, but with two young sons with cerebral palsy, his family needed the money and benefits. "I let the actions of others provoke me," Jefferson said. "But two wrongs don't make a right." Deputy Lancaster County Attorney Holly Parsley said racism always adds stress and tension. That Jefferson was part of the race he targeted didn't mitigate things, she said. "This is not just a mistake or a bad mistake. It's criminal behavior," she said. District Judge Karen Flowers said she lost sleep over what sentence to give Jefferson, but her decision came down to considering the deterrent effect jail time would have not only on him but others. "Your actions hit right into the things that scare people the most, Mr. Jefferson," the judge said. She sentenced him to a year in jail. Jefferson coached at Lincoln High School in 2005, leaving in spring 2006. He was an assistant at Nebraska Wesleyan University and Midland Lutheran College and head coach of the Lincoln Capitols and Lincoln Lightning indoor pro football teams. Reach Lori Pilger at 473-7237 or lpilger@journalstar.com. A week after Jose Jefferson got a year in jail for leaving threatening letters at Ameritas, a judge sentenced the woman who helped him.